I had so much fun checking out the new H&M store in Georgetown yesterday. And now, after having seen it first hand, I can tell you that it's even better than I pictured. It's also huge. Like...ha-uge. Just when you think you're going to reach the final racks it opens up to even more glorious retail space. And when you finally do get to the back of the store, you'll find yourself in the home section, which is full of so many amazing things. As if the clothing weren't enough, right!? I'm also completely obsessed with this blazer, which H&M was kind enough to let me pick out for the event. The bead epaulet detailing on the shoulders makes it such a statement piece that's perfect for so many occasions, including holiday parties (yes, they're coming up!) where it can be dressed up or down. I've rounded up some more jackets and tops with fun detailing below, so be sure to check them out! Love those pants!! 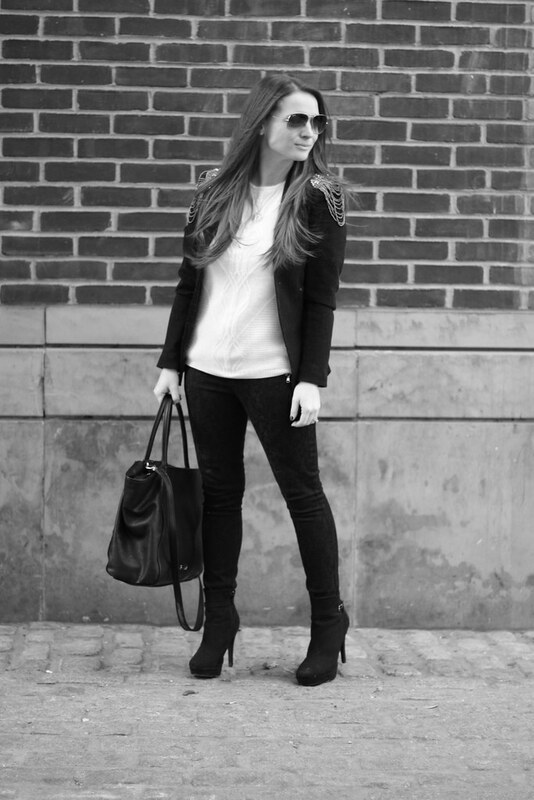 Can't go wrong with a black and white look! LOVE that jacket! You're absolutely right, that baby is going to come in handle for so many of the upcoming holiday parties. Buying this blazer NOW. Such a great look! Love the detailing on this blazer -- you're so right about being able to dress it up or down! That blazer is fantastic! I love it! It will look great with so many things. Oh how I wish there was an H&M near me. You know you can shop online with them now, right!? They just made it available a few months ago :) Apologies to your wallet if you didn't already know haha!